I love the colors! The colors are not to bright but not muted. The quality of duvet cover and pillows are exceptional. Definitely would recommend this bed ensemble. This beautiful, elegant duvet set is composed of 100-percent cotton for your comfort and to last you many years. 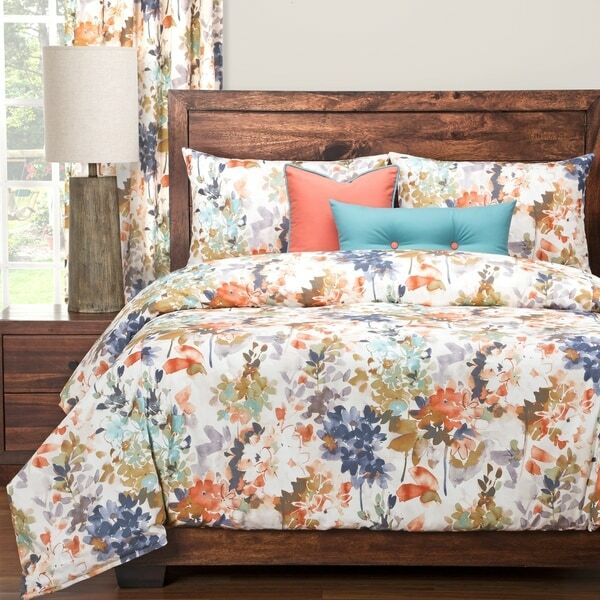 This luxury set features a watercolor floral pattern that is absolutely stunning and also includes toss pillows in a bright peach and Teal. The duvet cover is backed with an ultra-soft sheeting material that pairs maximum comfort with style. The duvet cover and shams have zipper closures for easy cleaning. The comforter (duvet insert) buttons in 8 places to ensure it does not shift in the cover. The duvet cover is filled with our eco-friendly down alternative comforter. Stuffed with a medium-weight fill made from recycled plastic bottles, this cozy comforter benefits your health and the environment when compared to natural down. The ultra-soft white polyester cover on this eco-friendly comforter cleans in the washing machine, making maintenance easy. This luxurious comforter is designed to keep you warm all year round. Beautifully made, very comfortable. I couldn’t understand the construction of the duvet cover/ duvet at first, but it is very soft on the side closest to the sleeper. The duvet cover material is heavy and very expensive. I sleep well under it. The pillows are all zipper closed, and are gorgeous. I love it! I was so disappointed when I opened the package. I love the design of the comforter but the top section of the comforter (designed section) is very rough. Not at all comforting, It feels similar to how burlap feels, The underside of the comforter is very soft but I like the top and bottom sections of my comforter to be soft. Overall very disappointed because the design and the colors are so beautiful. Oh my gosh it's beautiful. I got so excited when I opened the box. The colors are bright, modern and happy but not too loud. The material feels like linen. I haven't even put it on the bed yet and I love it. Beautiful colors , fabric is awesome! Just as it looks! Very nice. Beautiful, heavy fabric. Unfortunately, too heavy and hot for me. "Where can I find the euro shams shown in the pic?" It has the colors that go with my rooms paint color and it is beautiful. "Would this work with a navy blue table lamps and headboard?" It could work, it depends on your navy. The Summer Set Peach has a dark bluish purple color.